Many people who have visited Toji‘s wonderful temple markets will be astounded by this rural image of tea fields with the the five-story pagoda of Toji in the background. 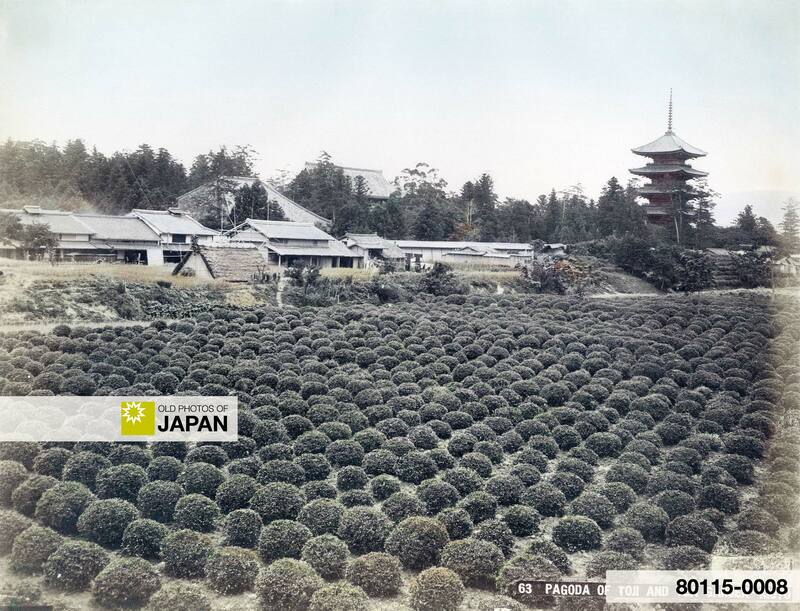 The tea fields have long since dissapeared and the temple is now surrounded by busy roads and modern buildings. Located near Kyoto Station, Toji (literally East Temple) is a Buddhist temple of the Shingon sect. Together with Saiji (West Temple), it flanked the road to the entrance gate to Kyoto known as Rashomon (also: Rajomon). The two temples were meant to protect the capital from evil. Sadly, Saiji was destroyed by fire in the 13th century and not rebuilt. Toji also succumbed to fire several times, but was rebuilt each time. The temple was established in 796, just two years after the capital was moved to Kyoto, but construction did not proceed smoothly. In 823, the important Buddhist scholar and monk Kobo-Daishi (also: Kukai) was asked by Emperor Saga to finish the project. This decision would eventually ensure the establishment of Shingon as an independent Buddhist movement. Therefore, Toji plays an important role in Japanese Buddhism. Toji is a wonderful place to visit when the temple markets take place. There are actually two. A big one on the 21st of each month, featuring everything from food, plants and used kimono to antiques. And a smaller one focusing on antiques, on the first Sunday of every month. During the market, the pagoda is a great place to escape the milling crowds. 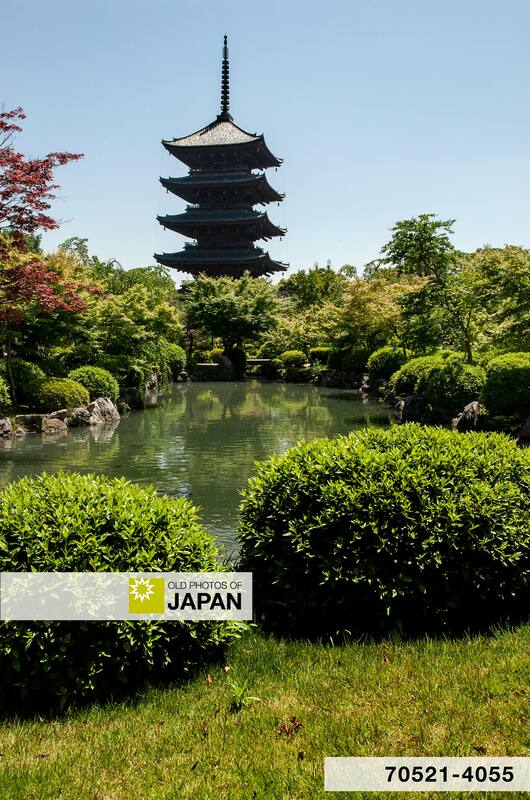 Surrounded by a neatly kept traditional garden with a pond filled with koi, it allows you to relax and while away the hours. 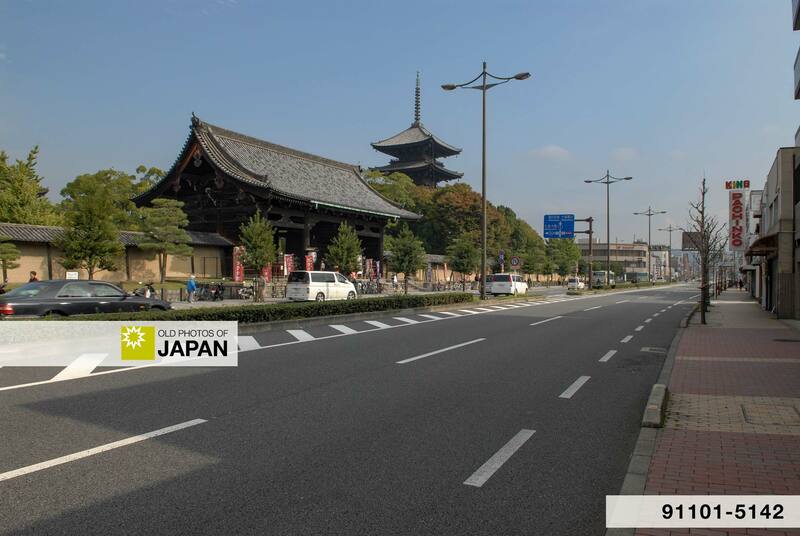 Along with 16 other locations, Toji was designated a World Heritage Site in 1994 (Historic Monuments of Ancient Kyoto). 2 弘法市～東寺縁日, 東寺教王護国寺. Retrieved on 2008-03-28. You can also licence this image online: 80115-0008 @ MeijiShowa.com.